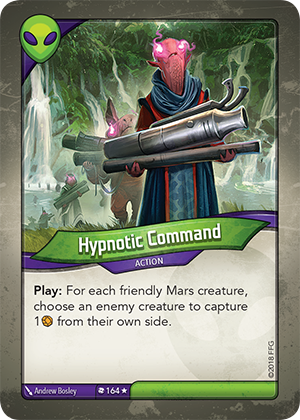 Card Text Play: For each friendly Mars creature, choose an enemy creature to capture 1 from their own side. When a creature with Æmber on it leaves play, the Æmber is always placed in the opponent’s Æmber pool, regardless where that Æmber came from. Effectively, Hypnotic Command functions like a delayed steal.